Let’s imagine you own a nice condo in one of the most frequented tourist destinations. Your rental business is going well but you’re beginning to get tired of the “cycle of renting.” Or maybe you’re in a not-so-frequented area and see less traffic year-round. Either way, there’s always something that can be done to boost the number of guests flocking to your place for a long-term stay. Advertising your vacation rental, screening guests, checking them in, helping them checkout – could there be an easier way of doing this, albeit while making a lucrative profit? Luckily, yes! Let’s consider long-term renting. Why Should Long-Term Renters Be on Your List? Allotting your vacation rental for the purpose of long-term renting can give you peace of mind by saving you from the hassle of checking in new renters on a continuous basis and constantly worrying about where the next one will come from. Here are 4 reasons you should consider catering specifically to long-term renters. 1. You’ll be getting fixed payments for several weeks or months. Hosting long-term guests means you’ll have a consistent flow of rent payments as opposed to small bursts of money from short-term renters. Since you have a fixed amount coming in, you can take a breath of relief. Any renovations or pending repairs can easily be taken care of. 2. You can lessen the burden of everyday costs. When you have long-term renters, it’s easy to accommodate for recurring costs. Long-term rent payments help you keep general necessities under control and ensure you have enough coming in to make up for any surprise expenses that may arise in utility or other recurring bills. 3. You’ll experience less turnover. Long-term renters stay for longer periods, giving you fewer vacancies to fill and thus, providing less guest turnover. This also means your property will have fewer chances to be exposed to excessive wear and tear as a result of constant short-term turnover. Moreover, long-term renters who leave happy will be more likely to write positive reviews about your vacation rental listing and may even go as far as to refer friends or loved ones. 4. Consistent rent means high peace of mind. Perhaps you feel like you’re earning a lot from your short-term renters. But what’s the guarantee of landing consistent guests? With every checkout, you run the risk of experiencing a period of vacancy when you’re earning nothing. By working with long-term renters, you keep your occupancy rates high and will be more likely to experience fewer extended vacancy periods. Even if you only have one or two long-term rental agreements per year, that’s still several weeks you haven’t spent searching or hoping for new guests to find your vacation rental listing. 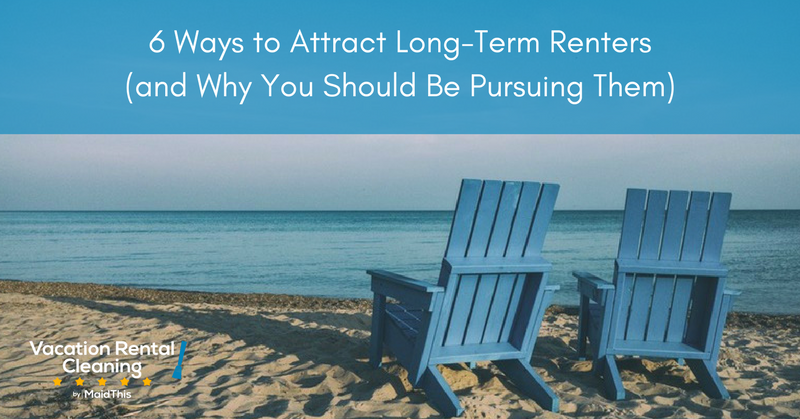 Just like attracting potential customers who will buy the product or service you’re offering, it’s essential to know how to attract long-term guests to your vacation rental. Long-term guests may be more interested in the amenities and overall coziness of your home than short-term guests. It’s important to do what you can to make them feel as comfortable as possible. Even little things that might seem petty to you can help make a guest’s experience more homey. Check out this article by Affordanything.com to get some ideas about what other hosts are doing and how you can do something similar. While you want to make your place comfortable, don’t forget to consider that long-term travelers might also be working while they stay. Some non-negotiable work amenities include providing a stable wifi connection and some kind of work space, such as a desk. Your guests will consider a number of factors including the location of your vacation rental, reviews left by previous guests, the images you share, and of course, your rental rate. Long-term renters will likely expect to get some kind of rent break or discount for their extended stay. As they will be with you for a longer duration, they might not be willing to shell out as much as short-term renters. Remember that while it may seem like short-term renting at higher rates yields you more revenue, it’s always temporary and never guaranteed. 4. Ensure the safety of the premises. While short-term renters will arrive and check out within a period of several days or a week, long-term renters will be there anywhere from a few weeks to a few months. Hence, they might be more concerned with the safety around your place and within it. Help them feel secure by installing sturdy locks and consider putting a small safe somewhere in the house. 5. Set rules and leave helpful instructions. Create an FAQ page that provides all pertinent details from sharing the wifi password to how all the electrical appliances work. This is an excellent way to automate the check-in process and make your guests feel more at home. 6. Focus on the appearance of your vacation rental. For long-term renters, coming to your place will be a bit of an investment. They’ll be paying more than short-term renters over the course of their longer stay and will want to feel like your place is their home. Show how your property is the best choice for them. Got a nice office area to flaunt? Have you decked out your living room with extra gadgets to make a Netflix night just like being at the movies? Upload photos of the things that set you apart on your vacation rental listing and let your potential guests see them with their own eyes! By catering to long-term renters, you’ll stand to gain a lot more than just consistent occupancy rates. Impressed with the quality of your vacation rental, they’ll be more likely to send other renters they know. No matter how you look at it, it’s a win-win. Need help getting your place ready for your next guests? Interested in providing your long-term guests with complimentary maid service? Schedule an appointment with us!